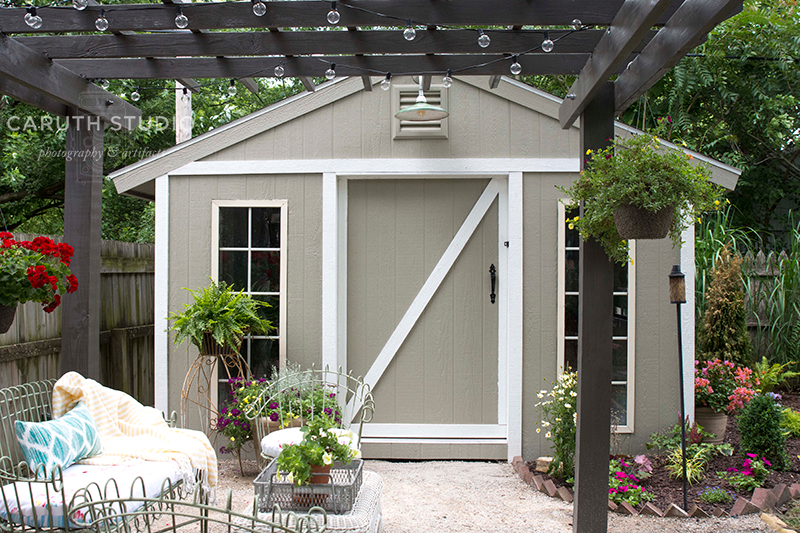 At 12 feet square, our DIY she shed is big enough to host several hobbies. We outfitted it to accommodate two favorite pastimes: reading and gardening. A four-foot-wide sliding barn door rolls aside to welcome visitors, while side windows provide ample natural light for a bright interior. We painted the walls, ceiling, and floor of our she shed, built with affordable construction supplies from Lowe’s Home Improvement, in Olympic One’s Silver Feather to reflect light and give all the raw construction elements a cohesive look. On the left side, a beckoning reading nook awaits. The vintage settee hails from the 1880s. To complement the antique piece, we created seat and back cushions from old grain sacks (thanks again, Elaine!). Vintage galvanized tractor funnels make a quirky trio of pendant light fixtures. They’re very simple to assemble: just place a phenolic light socket in the base of the spout and run the wire through the funnel spout up to the ceiling. Loop the wire over cup hooks in the rafters and either hot-wire the cords to a light switch (if you’re a confident electrician like Narvas) or plug them into extensions tucked into the eaves. An old chicken crate (well-cleaned, of course) becomes a nifty coffee table with the addition of lockable casters. A large zinc tray corrals books, a variegated purple waffle plant, and a pair of industrial-style candlesticks. With everything gathered on the tray, it can be whisked away quickly to leave the surface free for entertaining. A tri-color cowhide rug adds a layer of warm and softness underfoot, giving the seating area of the she shed a living room vibe. A few collectibles gather on a small hanging curio shelf next to the settee. Stacked vintage red American Tourister suitcases stand in as a storage-rich side table. They support a dracaena that appears to burst from an old kitchen tin. The leathery broad leaves of a fiddleleaf ficus add a bit of visual drama near the side window at the left. A small side table made from two stacked benches support an antique scale and a set of vintage books. The large Schefflera brings a note of fresh green to the corner. A rustic burlap pouf can act as additional seating when hosting guests in the she shed or as a comfy footstool with the coffee table rolled out of the way. A glossy red metal watering can and a Calathea roseopicta ‘Medallion’ in a galvanized bucket provide spots of color. We loved the lines of this old pagoda-style birdcage. We updated the natural bamboo with a spray of yellow paint. Over on the right side is the business end of the she shed. In the vintage red cabinet we can store outdoor table linens and entertaining supplies. An old kitchen cupboard provides shelf space for gardening and potting supplies. A Boston fern looks at home inside a hanging vintage egg basket. Rusty vintage grain elevator belt bins, nailed to a wall stud, hold packets of vegetable and flower seeds to be planted and a selection of gardening gloves. A distressed farm table makes a commodious potting bench. Sited beneath the north-facing window, it’s the ideal spot to provide soft natural light to plants. Under the table, an enameled metal bin holds mulch for potted plants. One of Dramm’s vivid rubber hoses (we LOVE these for watering) in red coils neatly inside a handled tub. This old tackle box, with its divided sections, offers lots of organization for fiddly items in a small space. A vintage kitchen whisk provides a spot to tuck seed packets that need to get into the ground—better than a memo board! A lockable tool cabinet is a good idea, even in a she shed. Whether you’re stashing sharp tools or hazardous chemicals, it’s best to keep things safely stowed. The deep recesses on both doors double the capacity of the old cabinet. Hanging it on the wall leaves floor space for more gardening tools like these plastic watering cans from Dramm. You can never have too many watering cans! A mix of vintage and new tools highlight the cabinet’s display and storage functions. Dramm’s gardening and watering implements in red and yellow offer long-lasting utility and knock-out color. You can’t lose these tools in the grass or border. It’s always handy to have a supply of potting soil available without having to dig through the plastic bag. We added an old galvanized grain scoop to our bucket to make it easy to fill large pots quickly. Tucked into the perfectly-sized niche between side window and door, a small spade is in the right spot for a quick grab-and-go when the tool is needed. The tour around our new she shed is complete. And so is the project that consumed us for several weekends this spring. We learned lots of new skills, had fun with our congenial crew, and consumed lots of Kurtis’s home-brewed beer (excellent stuff—keep up the good work, K!). We hope you gathered some useful information, too, or decided a DIY she shed could be in your future. And we’d love to see your own projects, so tell us about them in the comments section or share them on our Facebook page. Thanks to our project sponsors, Lowe’s Home Improvement Stores, Olympic/PPG, Dramm, and Costa Farms for making this series possible!